Defensive equipment including Fantasy-era armours, modern body armours, and Superhero and Science Fiction powered armour and force-fields. Movement gadgets such as jetpakcs, glider capes, teleportation disks, and rocketboots. Sensory and communications devices from simple radios to advanced holo-projectors and handheld scanners. 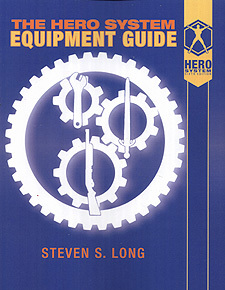 Whatever type of equipment your character needs, you're sure to find it in the HERO System Equipment Guide!